Power Consumption 3-Phase 100 HP Motor for Expeller 1440 R.P.M. 3-Phase 20 HP Motor for Kettle 1440 R.P.M. 4 Stage - 66" Dia.Steam jackets for efficient cooking of seed. Pipe fitting contains safety value, steam spray pipes, pressure gauge, steam valves, steam traps. The exhaust fan is also provided to extract excess steam or moisture from cooking chambers. The kettle is supported separately on a fabricated structure. 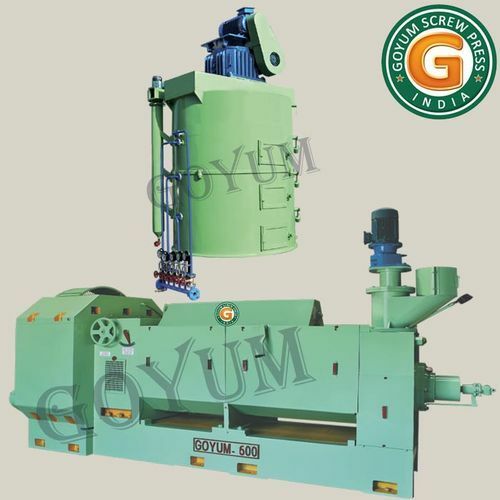 "Dedicated to the service of humanity", Goyum Screw Press manufactures and exports a wide range of oil mill machinery. The company offers tailor-made turnkey solutions to the clients right from designing and erection to commissioning and maintenance. Some of our product are CE Certified. For its environmental and quality management system, Goyum Screw Press has IS0 14001: 2004 and ISO 9001:2000 certification respectively. In addition, the company is a Government recognized Export House and is registered with Engineering Export Promotion Council, India. The journey to a historical success was started in the year 1977 with the establishment of Simplex Expeller Works by a visionary, Mr. Sat Parkash Goyal. The company was manufacturing spares for expellers before becoming a full-fledged manufacturer of complete expeller systems of capacity ranging from one ton to twenty ton. Later in the year 2000, Mr. Vinod Jain, S/o Mr. Sat Prakash Goyal, established Goyum Screw Press under complete technical guidance of Mr. Harbhajan Singh Seehra and started manufacturing oil mill machinery & expellers (ranging from one ton to one hundred and fifty ton). With state-of-the-art infrastructure and a team of experienced professionals, and skilled labor, Goyum Screw Press ensures to offer superior quality products at most competitive prices in least lead time. Following these much desired business values; the company has won laurels from its clients globally.